Measuring the impact of your scholarly work goes well past the familiar Journal Impact Factor. See the page in this guide for more information about additional indices, including those focused on the individual author and that author's work through time. Many of the tools you come across that provide you with one level of metric will additionally provide you with other levels of metrics as well. Because of this, use the tabs in this guide for additional information. The presentation on Measuring Research Impact at ECU was presented through the Office for Faculty Excellence. 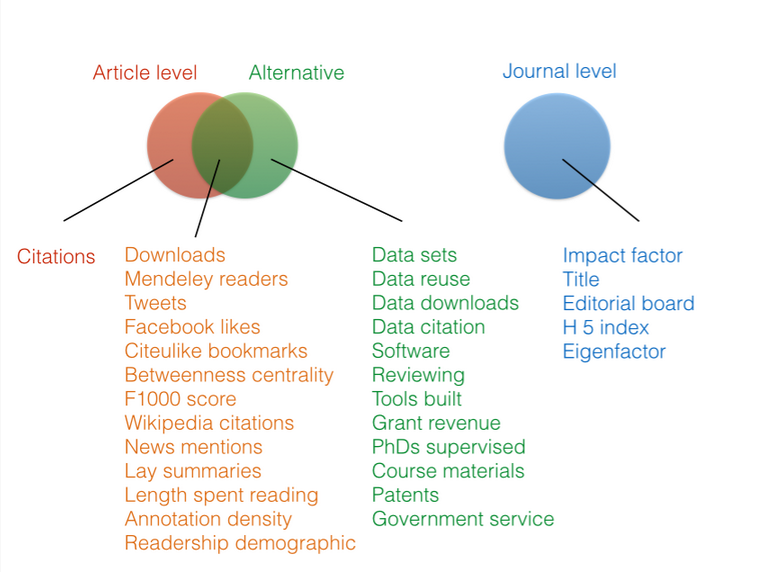 Journal level metrics demonstrate a rank of the particular journal within its particular discipline and are used as a proxy for the potential impact of particular articles. Primary journal level metrics include the Impact Factor, Scimago Journal Rank (SJR), and SNIP. See the Journal Level tab for more information. Many publishers offer article-level metrics to collect and collate article use information. These metrics, or altmetrics, may include the number of views/downloads, social media activity, mainstream news coverage, and usage among reference managers (such as Mendeley). Please see the Article Level tab for more information. Author-level metrics include the H-index and related indices. The H-Index is a metric that can be viewed in either graph or list form. The H-Index lists a number based on the number of citations to your articles. Authors can use several different sources for H-index, including Scopus, Google Scholar, or Harzing's Publish or Perish, or they can calculate their own H-index. See the Author Level tab for more information.